Yes she did hop up on the green planter box, right after this picture was taken. 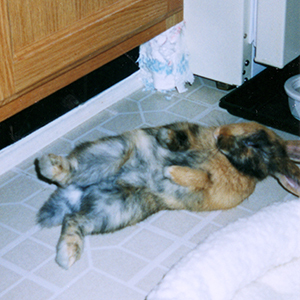 In her early kitchen days while we were bunny proofing her room and getting her litter box trained, her posture in this first picture was a sign. When Tigger looked at something, she was thinking and what she was thinking was, “I’m going to go there.” If she stood up on her hind legs and looked at something, that is exactly where she would be leaping next. I took this picture, then had to run for her right after it was taken. Tigger jumped up and landed on the top of the green planter box we had wedged to block access to the back of the refrigerator. I had just seconds to prevent her from hopping down and getting behind the refrigerator and the unprotected cord and outlet back there. 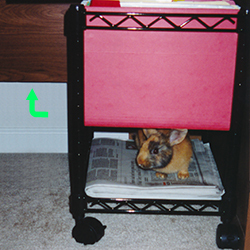 It was fortunate we learned this behavior in the kitchen because it allowed us to see and identify a lot of shortcomings in our bunny proofing when we moved her run and play time into the guest bedroom / office where her cage was kept. We knew if Tigger looked at something that she was planning on going there and we had better make sure that it was safe or truly off-limits inaccessible. When we saw her sitting up on her hind legs looking at the top of her cage, we knew that was next on her bunny to do list. We had to act fast, because the bars on her cage top were far enough apart that there was a good chance she would not have a safe landing and would harm herself. We got a piece of cardboard right away and cut it to the size of the cage top and held it in place by using Acco binder clips to clip the cardboard to the cage wires. With that in place, she hopped up and landed without the fear of a leg or paw dropping through the bars, but the cardboard was a bit slick and she almost went skidding off the other side. So we got a small throw rug the size of the cage top and used jumbo 4 inch paper clips to clip the rug to the cardboard. As you can see, she enjoyed her new hang out. Throughout her life, Tigger loved the high ground of resting on her cage top, able to completely and easily survey her rabbit domain to rest while plotting next moves. 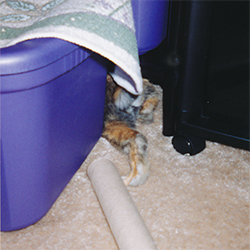 Tigger was extremely fast and we didn’t always catch her scouting looks, so she still got into to some places that we never expected. She used the cage top as a stepping stool and hopped from there up on to the desk and started looking at the hutch on the desk. We had to move things around so that the cage was too far from the desk for her to make the leap. 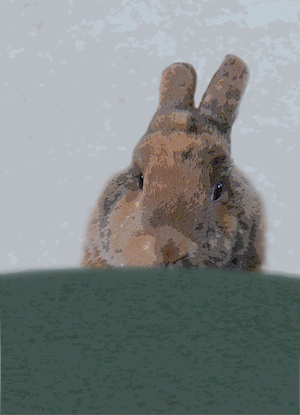 Otherwise, we thought it was entirely possible that she would hop up each shelf and get to the top of the hutch. It we had allowed that, it wouldn’t have surprised us at all if we had come into the room to see Tigger hanging from the ceiling fan. 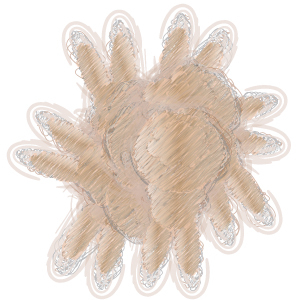 She seemed to set no limits for herself as you will learn in the rest of our posts this week. There’s a Tigger in Our Kitchen! 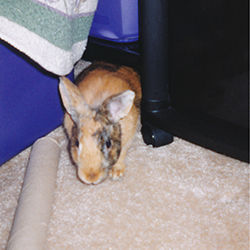 Initially, we put Tigger’s cage in the bedroom that we had set up as a combination office / guest bedroom. 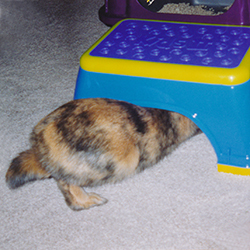 We didn’t have the room bunnyproofed at first and Tigger wasn’t litter box trained. 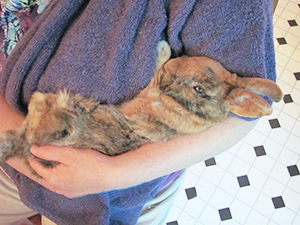 So, when it was time for runtime, we would take her to the kitchen. The kitchen was both easy to secure by blocking off the only entry into it and easy to clean with linoleum flooring. Only the spaces around the refrigerator needed blocking. Everything else was cabinets to the floor with no way for a Tigger to disappear or escape. We blocked one side of the refrigerator by wedging it with a roll of paper towels that she could also chew on while we wedged an upended planter box in to the space on the other side. We put our regular throw rugs away during Tigger training and purchased some small kitchen rugs that we could easily put in the washer and scattered those on the kitchen floor. We brought in a litter box filled with paper pellet litter. We put some cardboard over the only baseboard to prevent her chewing that. We now had an apartment pet security deposit to protect! We had a washable kitty bed for her to rest on and her carrier with the door off as a hiding box. She had a water bowl and food bowl on a plant tray to keep those tidy. The unexpected side benefit of the tray is she liked to flop on it. The sides supported her and it became bunny furniture. 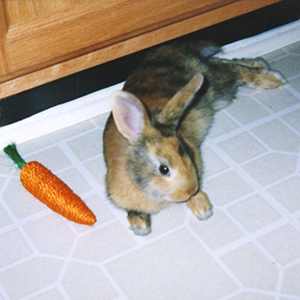 Tigger also had every bunny loving toy we could think of for her to chew, rattle or throw: empty paper towel rolls, jute / wood small animal chews, cat belled balls, a phone book. What do I want to do first? Would you care to explain these weird pellies in with my usual? Okay, what did I hop in? Maybe you should clean the floor more often? Would it be asking too much for some privacy here please! 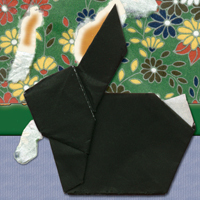 Coming next week, the Calico bunny rabbit.